Space is not only a hostile environment, it is also fatal to human beings. We must recreate our own native environment in order to survive in space. For spacecraft and space stations, this is essentially straightforward. But, on occasion, mobility is a requirement, and for that an astronaut has to be able to go outside. There are an entirely different set of problems associated with creating a suit to be worn in space, a suit which will protect the astronaut from the vacuum, the radiation, the heat and cold, and any number of other hazards. Spacesuits by Amanda Young, a museum specialist in Spacesuits and Astronaut Equipment for the Division of Space History of the Smithsonian National Air and Space Museum, documents the museum’s collection of such garments. Not all of the spacesuits created for NASA and USAF were gifted to the NASM, but those of historical significance certainly were. These include the ones worn by the Mercury, Gemini and Apollo astronauts. Also at the NASM are the Skylab and MOL spacesuits, and many early prototypes from BF Goodrich, David Clark Company and ILC. The book gives a short history of spacesuit development, from Wiley Post through to the Space Shuttle pumpkin suits. But it is the photographs of the suits in the NASM collection, by Mark Avino, which are the book’s chief draw. These have been taken against black backgrounds, and every detail is clear and sharp. Close-ups of various details also give an excellent indication of the suit’s construction. Spacesuits does not dig too deeply into the design of the spacesuits, nor does it dwell on the engineering in their manufacture. But some of the associated issues are covered: the need for constant volume joints, and the various solutions that have been tried; the materials used in the manufacture of spacesuits; the differences between “soft” suits and “hard” suits, for example. Sadly, some of the spacesuits in the NASM collection have deteriorated quite badly, but the museum has embarked on a programme to restore them and improve their storage. There is, I suppose, something sadly ironic in that – garments designed for one of the harshest environments ever visited by human beings have not survived unscathed in the considerably more benign surroundings of a museum’s storeroom. In part, this is due to the materials used – for instance, the rubber bladders have proven brittle because they were intended to be used only for one mission each. Spacesuits may not be an especially useful reference work, but it is a beautifully-designed book and the photographs in it are excellent. Perhaps it doesn’t necessarily belong in any self-respecting space enthusiast’s collection, but it’s certainly worth owning a copy. This entry was posted on January 24, 2011 at 2:22 pm and is filed under spacesuits. You can follow any responses to this entry through the RSS 2.0 feed. You can leave a response, or trackback from your own site. Space books, must have more space books! 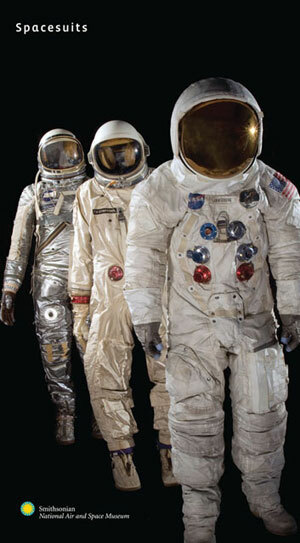 There’s a touring exhibit of some of NASA’s spacesuits and that is one show I would dearly love to take in. Ms. Young’s book sounds like it would make a great addition to my collection–the photos alone sound enticing. Thanks for the review, a few well-chosen words on a fascinating subject.